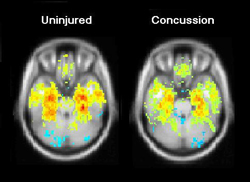 Comparision of brain scans before and after a concussion. Magnetic Resonance Imaging has been used to demonstrate that the effects of concussion persist long after the symptoms disappear. New understanding of concussion has been used in sports medicine as a basis for rule changes, as, for example, in the U.S. National Football League. In that league, since the installation of rule changes in 2011, concussions have been reduced by 12.5%, according to SportsConcussions.org. Installing behavioral norms for a meeting, as suggested here, will have two effects. First, the norms give the chair a means of charging bullies with violations. Second, installing norms has a deterrent effect. Photo courtesy U.S. National Institutes of Health. Workplace bullying in meetings is expensive, not least because it degrades the quality of the work performed in meetings. If allowed to persist, those who are targeted tend to shut down, depriving the meeting of their contributions. Moreover, once the bully has established dominance, solving the problem becomes more difficult. That's why bullying must be dealt with immediately. Workplace bullying is any aggressive behavior, associated with work, and primarily intended to cause physical or psychological harm to others. Although workplace bullying is usually cloaked in business purposes, the bully's primary intention is inflicting physical or psychological harm to consolidate power. In all cases, the chair is responsible for ending the bullying. Let's consider the least complex case first: neither the bully nor the target is the chair. In this case, the chair can demand a change in behavior. Here are six suggestions for chairs who observe bullying taking place. They follow a simple pattern: Prepare, Intervene, and finally, Escalate. Publish behavioral norms — ten or a dozen at most — before taking any other action. Examples: Be respectful, don't raise your voice, don't interrupt, wait for recognition by the chair, and so on. Incorporate in this list any relevant items from the company code of conduct. Prepare documentation that specifies for each bullying incident the date and time, the target's name, the bully's name, the behavior itself, and what you did about it. The audience for this document is the bully's supervisor, your supervisor, and possibly a Human Resources representative. As chair, when you notice bullying behavior, seize the floor. Typically, some behavioral norm has been violated. Caution the offender. For example, "George, let's be more respectful. You may continue if you agree to be more respectful. Otherwise I'll give the floor to someone else." Speaking to the bully privately deprives the bully of an audience. Explain that you regard the bully's behavior as bullying, that it must stop immediately, and that you'll take further action if it continues, but don't specify what action you'll take. If the bullying persists, speak to the bully's supervisor. Ask the supervisor to let you know when corrective action has been taken. bully of an audiencebully's supervisor doesn't act promptly and effectively, seek advice from your own supervisor. Perhaps your supervisor and the bully's supervisor can resolve the issue together. If these actions fail, the problem belongs to HR, since neither you, nor the bully's supervisor, nor your own supervisor has acted effectively to end the bullying. Present your documentation to a Human Resources representative, and ask for advice about what further action might be required of you. Would you like to see your comments posted here? rbrenNJdqguGzikbrkneyner@ChactXGHOyYkeknbjUxvoCanyon.comSend me your comments by email, or by Web form. See also Workplace Bullying and Effective Meetings for more related articles. I offer email and telephone coaching at both corporate and individual rates. Contact Rick for details at rbrenDfxFDCcbxrFOwiuTner@ChacGZplXswQTnhUdfwPoCanyon.com or (650) 787-6475, or toll-free in the continental US at (866) 378-5470.